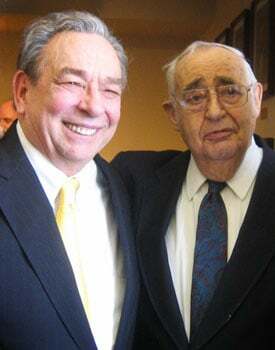 One of the great titans of the Christian faith died this weekend. I’m speaking of Dr. Roger Nicole, who at age 95 ended his earthly pilgrimage and has now entered into the joy of his Lord. While no doubt joyful for him, it is a very heavy thing to hear, as Dr. Nicole is, as far as I’m concerned, one of the legendary voices for the Reformed faith in the past century. I had the unspeakable privilege of serving with Dr. Nicole on joint faculties, at two different theological seminaries, Gordon-Conwell in Boston, Massachusetts and Reformed Theological Seminary, here in Orlando. In recent years, he and his wife Annette also worshipped with us frequently at St. Andrew’s. The respect that Roger engendered among scholars and among students was unparalleled. The contributions that he has made are profound. Here was a man with encyclopedic knowledge of the things of God, a mastery of the classics, and a rapier mind that could penetrate to the depths of theological and philosophical considerations and also a man who was known for his remarkable irenic spirit. He was avuncular, with a vengeance; he was a kind and gentle man. I could talk all day about anecdotes from my friendship and knowledge of Roger over the years. One of the things that I think captures him is when I once asked him if he agreed with a particular point and he said, “My dear brother, I think not.” I thought that was an unusual way to answer, and I asked him why he said, “I think not.” His reply was, “because I don’t want to say ‘I don’t think,’ I don’t want people to think that I don’t think.” That’s so typical of him. He always had a mischievous look in his eye, a kind of gentle impish spirit that so wonderfully accompanied his brilliance. As his last hours on earth approached, I know that Roger wanted to go home, to be in the presence of Christ, to be again with his beloved Annette, who pre-deceased him by a couple of years. And so I hope that you will thank God for His grace in gifting the church with such a servant as Roger. He has gained heaven and the church has lost a choice servant.